Honey Roasted Carrots infused with honey and garlic that are tender, sweet and savory and hands down the easiest side dish with only 10 minutes prep time! These Honey Roasted Carrots are absolutely obsessive worthy. I am thoroughly convinced they are the most delicious oven roasted carrots ever because of the most incredible secret-ingredient honey glaze EVER. They are the ideal holiday (Thanksgiving, Easter) side that everyone will devour like candy! They can be prepared entirely in advance then popped in the oven when it’s dinner time for stress free dinner or entertaining. This Honey Roasted Carrots recipe is sponsored by McCormick®. All opinions are my own. And I really did devour these oven roasted carrots like candy. As in I ate my entire test batch of honey roasted carrots in ONE sitting. Granted, I halved the recipe so it was only 1 pound of carrots instead of 2, but by the end, I was wishing it was 2. Roasting carrots is my absolutely favorite way to eat them. Roasted Carrots are not only fork tender but roasting enhances their natural sweetness and overall flavor while caramelizing the thinner ends. 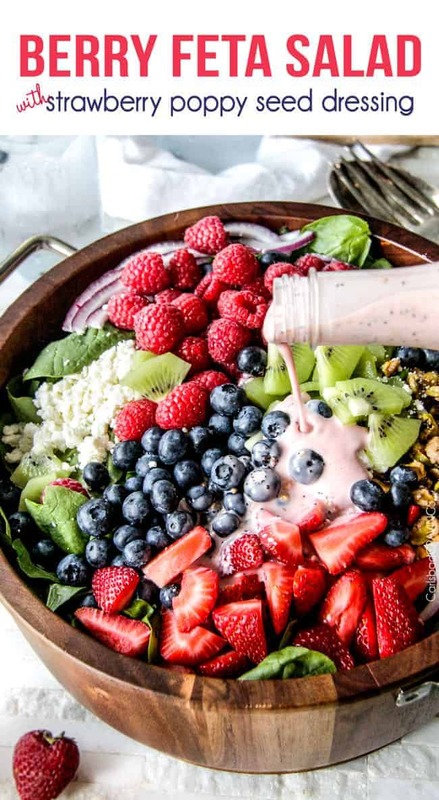 With one bite – you will never go back! I can’t wait for you to put this Honey Roasted Carrots recipe a to the test – and Easter would be the perfect occasion! Not only are they incredibly easy, they taste amazing at room temperature, so they would keep and/or transport perfectly if need be. Easy never tasted so gourmet. Unlike a lot of Easter dishes – or holiday dishes in general – you will want to make these Honey Roasted Carrots year round because they are just that good and you can just pop them in the oven while you prepare the rest of your meal. They are my modern twist on roasted carrots bathed in the most irresistible glaze that they drink up as they tenderize and the bottoms begin to caramelize – my favorite part. After you taste these carrots, you might just realize they are the only way to eat carrots from now on. 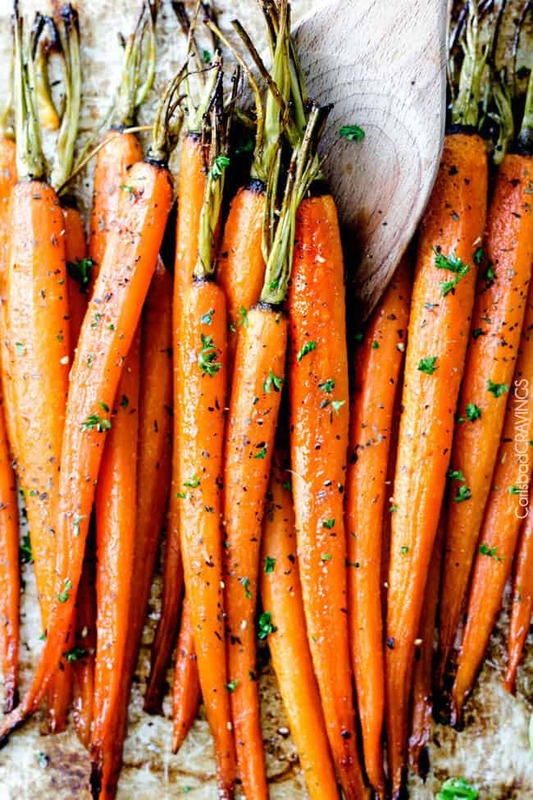 Sometimes grandma’s recipe takes the cake, and other times, re-imagined traditional dishes are unimaginably more delicious like these carrots. Some of my other favorite re-imagined holiday recipes include my Cranberry Apple Pecan Wild Rice Pilaf, Herb Scalloped Sweet Potatoes with Bacon and Gruyere, and my Maple Dijon Green Beans with Caramelized Pecans. You will love them all! What all these dishes have in common is not only the delectable, fresh flavor combinations, but they are deceptively simple. Win-win! 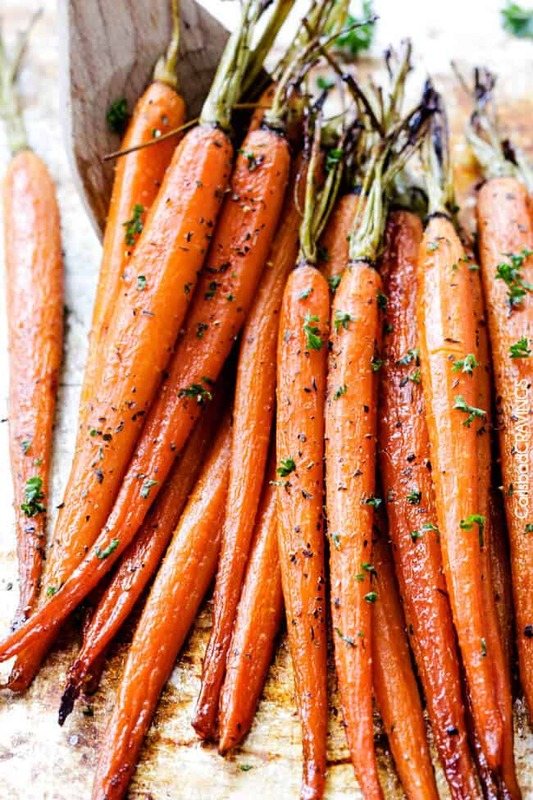 What Should I Serve with Roasted Carrots? What Carrots are Best for Roasted Carrots? 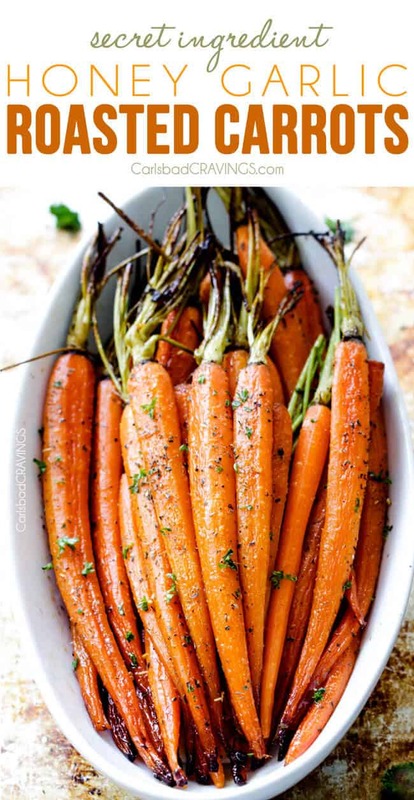 THIN CARROTS: I prefer to use whole thin carrots in this Honey Roasted Carrots Recipe. They are sometimes called baby carrots, not to be confused with baby-cut carrots, which are small chunks of baby carrots. Baby carrots are simply thin, young, carrots that are not tough or woody. They can often be found in the organic section of your grocery store. Sometimes they come in multi-colors which makes for beautiful for presentation. Baby carrots will come with the tops on if you purchase them in the organic section. I like to trim the tops but not cut them off completely, just for presentations sake. MEDIUM CARROTS: If you can’t find thin, baby carrots, then any thin carrots will work great. The important thing is that they are relatively the same size so you don’t end up with crunchy carrots mixed with tender carrots. TRADITIONAL CARROTS: If using larger carrots, then cut the extra thick carrots in half lengthwise and adjust cooking time. You will know when the carrots are done because they will be fork tender. BABY CUT CARROTS: Baby-cut carrots that come in the bag would be my last choice for this Honey Roasted Carrots recipe. I don’t find they have as much flavor when cooked. If you choose to use baby-cut carrots, you will want to slice any extra large carrots in halve lengthwise. DO YOU NEED TO PEEL THE CARROTS? I prefer to peel the carrots for aesthetic reasons, otherwise they look a little too rustic for my taste. The carrot peel, however, is safe to eat once scrubbed clean so you can leave the peel on if you prefer. First, peel the carrots if you like otherwise scrub them clean. Cut any larger carrots in half lengthwise so the carrots are all roughly the same size. 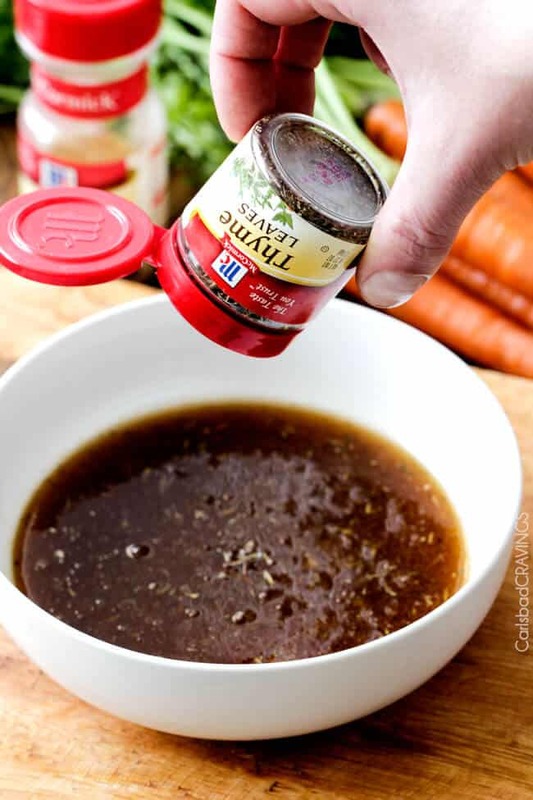 Whisk together the honey glaze consisting of honey, olive oil, butter, balsamic vinegar, and your bevy of spices including salt, McCormick Garlic Powder, McCormick Ground Mustard, McCormick Thyme Leaves, and McCormick Ground Cumin – and your secret ingredient – apricot preserves! The preserves create an irresistible glaze while complimenting the sweetness of the honey with a slight tang while the seasonings enhance the savory of the carrots so they are perfectly balanced – not too sweet, not to savory, but just right. 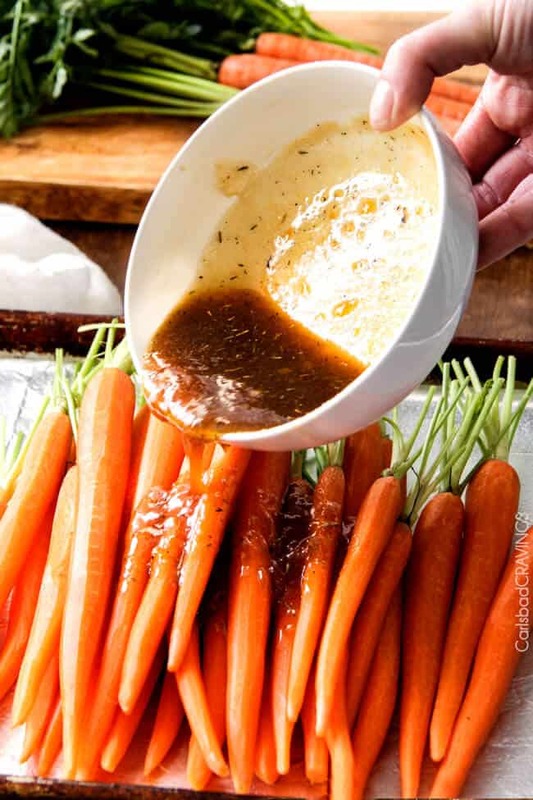 After you toss your carrots in the Honey Garlic Glaze, it will seem like a lot of Glaze – but be excited because all that Glaze gets sipped up by the carrots for the most tender, flavor infused carrots. Finally, oven roast the carrots until tender. How do I roast carrots in the oven? Thin roasted carrots will require approximately 30-45 minutes in the oven at 375 degrees F. I have made these Honey Roasted Carrots many times, and the roasting times always varies because the size of carrots vary. If you have thinner carrots, they will take closer to 30 minutes, thicker carrots, closer to 45 minutes, but all you have to do is stick them with a fork and when they are fork tender – you know they are done! We have all heard that eating carrots is good for your eyesight, but they are also rich in antioxidants, vitamins (specifically vitamin A), minerals, and fiber. Evidence suggests that eating more antioxidant-rich vegetables like carrots can help reduce the risks some cancer and cardiovascular disease. so bring on the oven roasted carrots! Maple Dijon Roasted Brussels Sprouts and Butternut Squash. Want to try this Honey Garlic Roasted Carrots recipe? Pin them to your Side, Vegetable or Holiday Board to SAVE for later! Roasted Carrots infused with honey and garlic that are tender, sweet and savory and hands down the easiest side dish EVER with only 10 minutes prep! These Roasted Carrots are absolutely obsessive worthy. I am thoroughly convinced they are the most delicious oven roasted carrots ever. They are the ideal holiday (Thanksgiving, Easter) side that everyone will devour like candy! Preheat oven to 375 degrees F. Either line a baking sheet with foil and lightly spray with nonstick cooking spray OR spray your baking sheet with cooking spray. See Note**. Add carrots to the center.. Set aside. In a medium bowl, whisk together all remaining ingredients and pour over carrots. Toss until evenly coated. Line carrots in a single layer. Bake for 30-45 minutes depending on carrot thickness, until fork tender, stirring after 20 minutes. *** Roast longer for more caramelization. Garnish with fresh parsley if desired. *Thin carrots are often called baby carrots- not to be confused with baby-cut carrots. They are young, thinner carrots that are not tough or woody. They can often be found in the organic section of your grocery store. 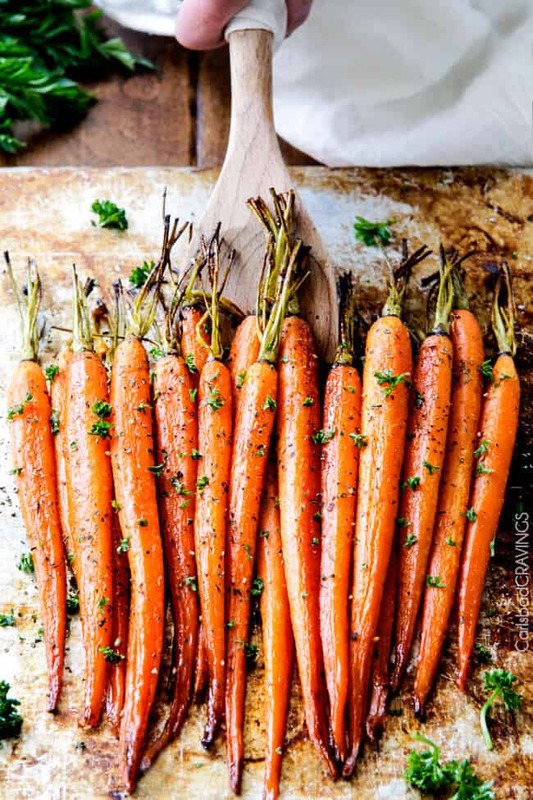 If you want to use different carrots then cut extra thick carrots in half lengthwise and adjust cooking time - carrots are done when they are fork tender or roast longer for more caramelization. 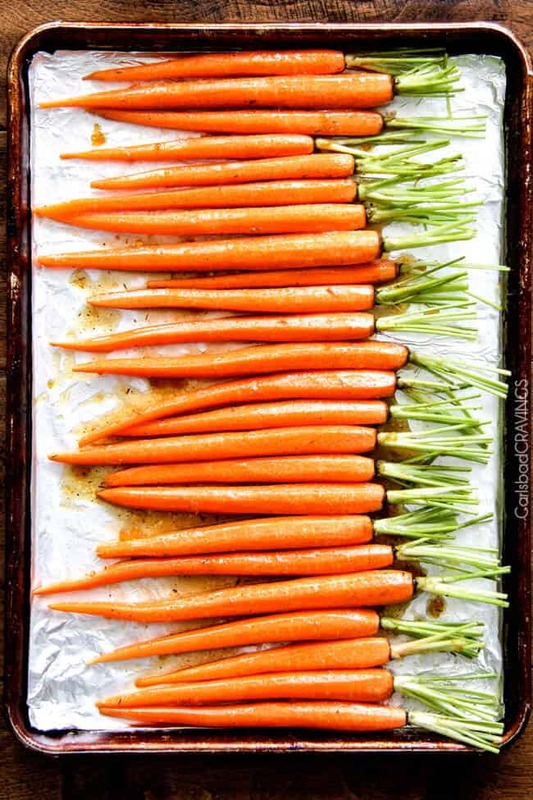 **If you use thinner carrots, you might not want to use foil because the carrots will caramelize better in the shorter roasting time without foil. ***When you stir at 20 minutes, the Glaze will have liquefied and there will seem like a lot of moisture but the carrots will absorb the moisture/Glaze as they continue cooking. Can you use baby carrots? I have a big bag of unopened baby carrots & this would be a perfect way to make them. Hi Pam, absolutely! I would just fill your baking sheet up so they fit in a single layer – the only thing that will vary is the cooking time – you will just have to check them a few times to see when they are done. Enjoy! I am loving the visual of your orange little son – haha – loving vegetables from a young age is a great thing! Yes, totally adapt this recipe any way you want – I am excited to see your version! I’ll look for it in IG! I hope you have a fabulous Easter!! yay! I’m so excited you are making these for Easter, I think everyone will love them – including your husband 🙂 And I am right there with you – I like Cooked/roasted carrots WAY better than raw – and the flavor combinations are endless! Your brown sugar/curry combo sounds wonderful! Thanks Dorothy! Making these for about 30 people for Easter…was planning on using baby carrots but I’m concerned that I’ll need too many to put in a single layer. Any suggestion? Also, how many would you suggest? Hi Stephanie, I am so sorry for getting back to you late – I have been road tripping and away from my computer. I would still use baby/thinner carrots otherwise you will just have to slice the larger ones in half. As far as how many to make – that totally depends on how large of serving/how many other sides there will be. You should be able to fit about 30 carrots in a single layer (single layer down the pan then filling in the leftover side area), so if everyone got 5 carrots then that would be 6 servings per recipe – so for 30 people that would mean 5x the recipe. Hope this helps, good luck! The carrot picture in this recipe are not baby carrots…..or are these baby carrots somewhere else besides California? Hi Marilyn, by baby carrots, I am not referring to the small capsule-shaped carrots that are often for snacks but to carrots that are thinner and still young and not tough or woody. You can often find these carrots in the organic section of your grocery. Hope this helps! I pinned this recipe several days ago to make for Christmas dinner tomorrow. I just came back so I could plan out my cooking schedule and “Cystic Fibrosis survivor” caught my eye in your little bio on the sidebar. My 14 month old son has CF as well. Is it silly that this CF connection makes me even more excited to try this carrot recipe? 😉 I look forward to growing more of your blog when I don’t have a Christmas Eve to do list but wanted to take a minute now to write a note. Happy Holidays! Hi Laura, I hope you had a very Merry Christmas! Thank you so much for taking time to drop me a note! There has never been a more promising time for individuals with CF – so many medical advancements to take advantage of and they are so close to “the cure.” I wish your son much health and both of you the Happiest New Year! Bar none, the most delicious carrot recipe I’ve EVER tried. And that’s saying a lot cause I’m no spring chick! I served this with creamy mashed potatoes and melt in your mouth prime rib. Everyone raved about the carrots. Note: Since the prime rib was in the oven up until 20 minutes before we served the food, I didn’t have time to roast the carrots per the recipe, so I pre-steamed the baby carrots for 16 minutes, let them dry out a bit before tossing them with the delicious sauce and then (while prime rib rested) roasted them on a pam sprayed cookie sheet at 400° for 20 minutes, stirring a couple of times along the way. THANK YOU for this recipe. Now, the only carrot recipe I’ll use! YAY! What an awesome comment/review, thanks so much Kathryn! I am so flattered this is the only carrot recipe you will now ever use! Wow! These were sooo good! A new staple for me. Served them with Stovetop Stuffing Meatloaf, went so well together and easy to do! Baby carrots are out of season and I’m not big on the little store ones so I peeled and halved the large ones, cooked for 40 min Thanks for sharing! Yay, I’m so glad these were such a hit Amanda, thank you! And I’m so glad halving the carrots worked perfectly! They sound perfect with your Meatloaf – yum! Hi there! Im planning to make your carrot recipe for Easter dinner tomorrow, like mentioned above I am making the Prime rib and mashed potatoes. I may also steam them first so they are ready when the meat is. Hi Beth, your Easter menu sounds delicious! I a assuming your talking about the sauce for the carrots? Yes it absolutely can be made ahead of time and finished in the oven. Happy Easter! Yes, that was my question, lol! Thank you for replying so quickly! Also, I’m hoping that I can get close to this by using orange marmalade (what’s on hand) instead of apricot preserves. Any suggestions? You are so welcome! Orange marmalade is definitely more tangy so I think it will still be delicious just a little different flavor profile. I made these yesterday for Easter along with apricot glazed ham and maple honey turkey breasts on the smoker. Everything was a hit but Most compliments came from the carrots! Everyone raved. Thanks so much, I have been trying out lots of your recipes and gaining dad/husband of the year status. Cheers! Awesome Craig, I’m thrilled everyone raved about these carrots, thank you! Your Easter menu sounds wonderful and you sound like an incredible cook! I’m so happy you have been enjoying trying my recipes and your family as well – hope you continue to find many new favorites! Made these last night. My son asked, “What did you do to the carrots?” I wasn’t sure how to interpret this comment, but I soon found out that he really LIKED them! We all did! I used the baby carrots in a bag, halving the thicker ones so they were about the same thickness. Since carrots are usually on the sweet side to me, I decided to omit the honey to reduce sugar/calories. They were still very tasty, although I’m sure honey would add even more goodness! Awesome Maret, I am so happy these were a hit with the entire family! Thank you! I didn’t have apricot so used blueberry. Unpeeled organic carrots – diagonal cut chunk style and lots of fresh garlic. Thank you!! Take Care. Sounds absolutely delicious Cheryl, love all the extra garlic! I’d like to make these for (Canadian) Thanksgiving this weekend but I’m concerned about timing and oven space – do you think they would still be delicious if I did them the day before, stored them in the fridge overnight, and then warmed them in a dish prior to serving? Times like these I REALLY wish I had a double oven! Can’t wait to try them either way. Hi Amber! Yes, these carrots reheat very well, so that shouldn’t be a problem at all. Enjoy! Happy Thanksgiving! Very good and different for a change! I used regular organic carrots and split the thicker ones down the middle. Everyone enjoyed them. I’m so happy they were a hit, thanks Cheri! Hi Jackie, I have never done it before but you can certainly try so I’m not sure if the glaze would burn and become too sticky if added right away. You might want to cook the carrots until partially tender and then add the glaze. Any idea if these could be cooked at 350 instead of 375? I’ll have other things cooking at the same time. Thanks! absolutely – you will just need to adjust cooking time. Thank you for your awesome comment Ty! I’m thrilled this was a crowd pleaser and worked with larger carrots too! Happy holidays!